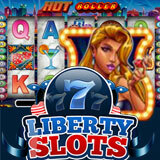 Liberty Slots Tournaments are a great way to win big money without risking a lot of your own and LS has become one of the best places for slots tournaments. Right now you can play in their $30,000 Hot Shots Slot Tournament and awarding $30,000 in prize money or one of their many daily tournaments that award more than $100,000 every month. You have until January 31st to achieve the top score on the popular Vegas-themed slots game, Hot Roller. First prize is $5000. Introduced last spring, Hot Roller is a twenty-five pay line video slot that gives players a taste of the casino high life with symbols like roulette wheels, chips, dealers and show girls spinning on its five reels. They can enjoy Hot Roller from as little as a penny a line or, if they’re feeling extra lucky, bet up to $250 on a spin. Three flaming dice symbols trigger a unique bonus game that casino fans will love. It’s a craps-style Dice Roll that can award up to 36 free games. All wins during Free Spins are multiplied up to six times so the free bonus game can payout up to $600,000.